Australian citizenship. How to become an Australian Citizen? You are here: Home » Australian citizenship. How to become an Australian Citizen? Before applying for Australian citizenship, you must check your Australian citizenship eligibility. In other words, you must ensure whether you can get an Australian citizenship at all. There are few different ways on how to become an Australian citizen. The best would be to be born as an Australian citizen, but you didn’t come here to read about that. If you don’t have the time to go through everything by yourself give us a call and we’ll check everything for you, otherwise – continue reading. I’ll write here about how to get Australian citizenship through permanent residency, it’s called “Australian citizenship by conferral”. live in Australia as a permanent resident. It doesn’t matter what kind of permanent visa you hold – whether it is partner visa, skilled visa, ENS, or the other permanent residency visa. satisfy the residence requirement to be eligible for Australian citizenship. This one is tricky – I will write some more info below. be of good character if you are at least 18 years old. It might become complicated if you’ve been sentenced in the past, however very often could be challenged whether your sentence will disqualify you from applying for Australian citizenship. must have been living lawfully in Australia on a valid visa for four years immediately before the date of application. Within these 4 years, last 12 months must be spent in Australia as a permanent resident. must not have been abroad for more than one year cumulatively, during last 4 year period. Additionally, you could not have been living outside Australia for more than 90 calendar days in the year immediately before applying. Do you hold a permanent visa? Have you been living in Australia lawfully for last 4 years? Have you been living in Australia as a permanent resident over last 12 month? Have you been living in Australia at least 9 months over last 12 months? If you have answered “YES” to all the above questions, you’re half way there as residence requirements look to be met. Story: Mary came to Australia 01 January 2012 as a temporary resident. She was a holder of a student visa. After graduating in February 2014 she applied and has been granted with skilled graduate visa. After few months, she applied for skilled independent visa and has been granted with her 189 visa on 19 August 2014. Mary is going to apply for citizenship 30 April 2016. She lived in Australia for all the time. Verdict: Mary met residence requirement and might be eligible for Australian citizenship. Verdict: Vijay does not meet residence requirement. Although he’s living in Australia as a permanent resident for more than 12 months, he must be living lawfully in Australia for at least 4 years. Story: Xiu came to Australia a tourist 07 June 2011. After 2 months he decided he wants to continue his education in Australia, he applied and has been granted with a student visa. For personal reasons he had to take a break from his school between 01 January 2013 and 01 October 2013 – he spent this time in China with his family. He came back to Australia 01 October 2013. Once he finished his school he has been employed in one of regional Australia cities. His employer sponsored Xiu for RSMS visa, which have been granted 01 February 2014. A year later 01 March 2015 Xiu flew back to china to spend some time with his family. He came back 01 July 2015. Xiu wants to apply for citizenship on 18 April 2016. Verdict: Xiu does not meet residence requirement. Although he first arrived in Australia more than 4 years ago, he did not spend cumulatively 3 years over last 4 years period of time before intended date of citizenship application. In addition, he’s been overseas for more than 3 months over last 12 months. What does it mean lawfully? A lawful residence is about living in Australia on a valid Australian temporary or permanent visa. If any of your parents was an Australian Citizen on the time you have been born, you may be eligible for Australian citizenship by descent. Contact us to check if you could lodge Australian citizenship application on that basis. how to apply for Australian citizenship. You need to apply for a citizenship, it will not be granted by default. If you like paperwork – relevant paper form must be filled and send to nearest Department of Immigration if you are in Australia. If you are overseas paper application must be sent to department’s Overseas Citizenship Unit at Canberra office in Australia. An application must be accompanied by a payment of course. you should use Form 1290 Australian citizenship – Other situations. Interesting – if you don’t understand nature of the application and can’t fill 1300t form you may use another form. Don’t be worried – we are here to help – we can do all the paperwork for you. This chapter is about: application for Australian citizenship. Once you have confirmed you might be eligible for Australian citizenship it is the time to go to department’s website and lodge the application online. Right? Nope, sorry. Before lodging Australian citizenship application check if you have all the required documents which must be attached to the application. If you are missing some crucial documents you might not be eligible to apply online, and will have to lodge the paper application. Identity declaration (Form 1195) completed by a person with the appropriate authority. Good character documents. You will have to provide penal clearance certificates from all countries if, since the grant of your permanent Australian visa: you have lived or travelled overseas since the age of 18 years or over, and the total time spent abroad added up to 12 months or more, and the time you’ve been in any one country was more than 90 days, or department asks you to do so. If you are applying outside Australia, then Australia needs to be considered an overseas country. If you have collected all the necessary documents now is the time to determine if you can lodge the application online or need to send a paper form. did not travel in and out of Australia since July 1990. In above situation paper application is only one allowed. Before lodging the actual online application, you will have to create your very own IMMI account. 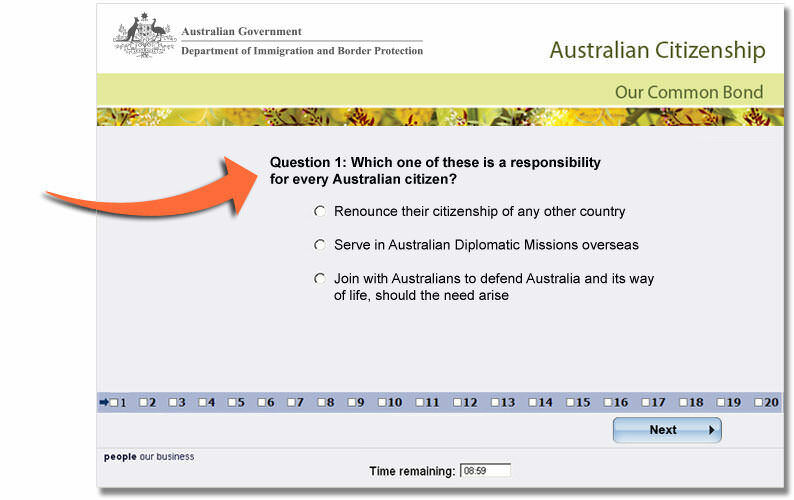 Once you’ll get your account login, choose Australian Citizenship application and follow the prompts. 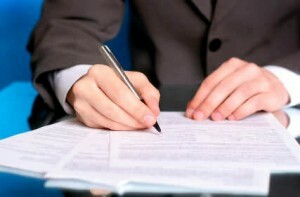 At the end, you’ll be requested to attach relevant documents and pay the fee. You will have to show original documents during your visit to the department for a Citizenship test. Unless you are exempt you must pay a fee for a citizenship application. Unless you are eligible for confession it’s gonna cost you $285 (as of February 2016 – may change – best to check department’s website). Concession fee is $40 and does apply in general to pensioners. Childres under 16 yeard old (if included in parent’s application) stateless people and people who served in Australian Army don’t pay a dime. Before you will be granted with Australian Citizenship it is required for you to sit Australian citizenship practice test and pass it. They will put you on the front of a computer and run the program. There are 20 questions you will have to answer. Each question will have a couple of possible answers – you will have to choose the right one and go to next question. The test is timed – you will have 45 minutes to complete the test. Australian citizenship test pass mark is 15 correct answers out of 20 in total. If you will fail at the first time, you can do it again and again within 45 minutes, but do not expect to get the same questions each time. If you will still fail, then you will have to reschedule the test. Fee for Australian citizenship test is included in an application fee, so you don’t have to pay anything even if you’ll have to sit the test multiple times. There is a brochure released by the Department of immigration called “Australian Citizenship: Our Common Bond” (available here). In reality, that publication has all the information required to help you pass the citizenship test. It contains 5 parts, where only first 3 parts are testable: (Part 1 – Australia and its people, Part 2 – Australia’s democratic beliefs, rights and liberties and Part 3 – Government and the law in Australia). Last 2 parts are for your information only are are non-testable (Part 4 – Australia today, Part 5 – Our Australian story) it also contains example questions. There really is no point to buy any “Australian citizenship test questions and answers” from the internet. If you are having troubles with English or prefer to read in your own language, brochure has been translated and is also available in Albanian, Amharic, Arabic, Bosnian, Burmese/Myanmarese, Chinese Simplified, Chinese Traditional, Croatian, Dari, Dinka, French, German, Greek, Hindi, Indonesian, Italian, Japanese, Karen, Khmer, Kirundi, Korean, Macedonian, Nepali, Persian/Farsi, Portuguese, Russian, Serbian, Sinhalese, Somali, Spanish, Swahili, Tagalog, Tamil, Thai, Tigrinya, Turkish, Vietnamese. To make things even easier Department of Immigration prepared videos, so instead of reading their brochure you can just watch videos few times and if you watched carefully you should be in a position to pass the test. There is also practice test available on department’s website. It will be exactly like that when you’ll be sitting your very own test. Here are “Australian Citizenship – Our Common Bond” videos, enjoy! This chapter is about becoming an Australian citizen. Once you’ll get through all the steps of Australian citizenship application including that lovely test, which probably 70% of native Australians would fail as some people say, and your citizenship application is approved, you will be invited to attend your citizenship ceremony. Once you receive a letter that your application is approved, you will need to attend a citizenship ceremony and make the Australian Citizenship Pledge. This is the last step of becoming an Australian citizen. Ceremonies are usually held within six months from the time of application approval, but waiting times can vary between local councils. 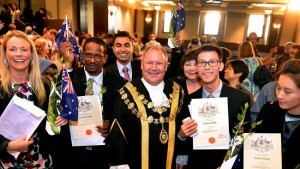 Most citizenship ceremonies are organised and hosted by local councils not Department of Immigration. There are some popular dates for citizenship ceremonies such as Australia Day, Australian Citizenship Day, Constitution Day, Australia’s Local Hero Award, but ceremonies could be held on any other day as well. Citizenship ceremonies fulfill requirements under Australian citizenship law and also provide an important opportunity to welcome new citizens as full members of the Australian community. 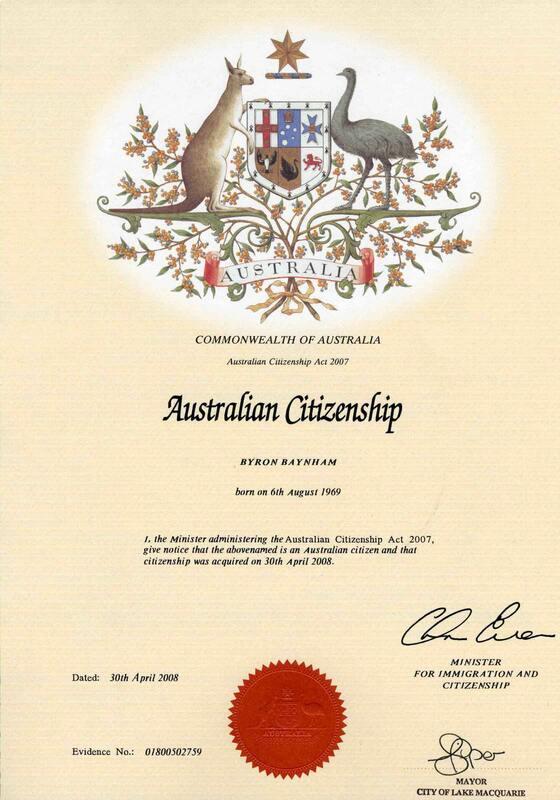 During Australian citizenship ceremony you will also be given an Australian citizenship certificate. This is an official document which confirms that you are an Australian Citizen and it could be used as a proof of citizenship to confirm that you are an Australian. You will need it when applying for your Australian passport. 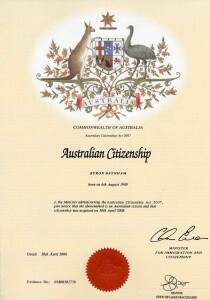 Australian citizenship certificate number could be found in a bottom left corned of the document. Click on the copy of certificate to see it in full size. Should you require assistance with your Australian citizenship application do not hesitate to contact us or book a consultation with a migration agent. We’re here to help! I hope this article was helpful. Feel free to comment, or post your questions below. And don’t forget to share on a social media. What happens on odd cases when the applicant does not pass the citizenship test on multiple attempts? An interview is the other option. Could also be chosen by those who have problems with understanding English. If a child has been diagnosed with a long term disability and receiving government funding for the disability while a permanent resident, will her citizenship application by conferral be refused? A Child below 16 who is holding a permanent resident visa is eligible to apply for citizenship even he is spending most of his time oversea ? Parents holding PR visa too. Do we need to past a health requirement/check for Australian citizenship by conferral? For example if a person who is a permanent resident has been diagnosed with a long term disability which would make him eligible for government funding/support while she is a permanent resident, will her citizenship be refused due to this? Also what happens to the permanent resident status if citizenship application is refused. I’am Linda, 3 years ago, I have lost my previous passport which has the stamp of Aus Immi “First Arrived Date”, but I and Dad came to Australian in the same date. He still has the stamp on his passport but I don’t have any document that can proof my “First Arrived Date” other than my previous passport. What should I do to proof “First Arrived Date” document? Declaration should be satisfactory. Department shall have that information in their database, but it is your responsibility to provide with the information. Are you asking about Indian citizen certificate? Sorry can’t help you with that. 1) can he/she apply for Australian citizenship online? 2) can he/she complete citizenship test, while working offshore, e.g. in the US? 3) can he/she complete oath taking ceremony, while working offshore, e.g. in the US? If person A has been living in Australia as PR for last 4 years (without break) but employer sends him/her abroad on an international assignment 2 months before completions of 4 years, can he apply online while being offshore? he has completed 46 months already but is not physically present in Australia. If you are unable to sit a test for some reason there are other ways to satisfy citizenship test requirement. This somehow confuse me. What if I haven’t been out of Australia for a total of 12 months but spent over 90 days in one country, do I still need to provide a Penal Clearance Certificate? Hi, I was recently granted citizenship by descent. What’s next and what about my children? I meet all the residency requirements for citizenship application. However, i need to visit my home country for addressing some urgent medical issues. I plan to return again after finishing my medical issues. Can i apply for Australian citizenship while staying in my home country? Will the DIBP reject my application as i will be outside Australia while making the application? My son is 4years old, was born overseas while I was holding PR and living in QLD. He became permanent resident in October 2015 and since January 2016 , he is living overseas with his mom. I am australian citizen. Can I apply for my son citizenship as soon as he arrived back to Australia or there is some requirement for that ? I have officially been a permanent resident for one year but have lived and worked here on the 457 visa for three and a half years prior and one year on the working holiday visa before that, totaling five and a half years living and working (for the same company) in Australia. Does my time here on there 457 visa count towards ‘permanent resident time served? I should have been eligible to apply for citizenship on the 6th of June this year but with the new citizenship rules implemented on the 20th of April, I believe I’ll now have to wait another three years before applying. Is this correct? I’ve Certificate of Good Conduct dated year 2011 from my home country. The certificate was used to apply my PR. I was granted PR in year 2011. Then I moved to Australia permanently in 2013. I’ve been staying in Australia since 2013. If I would like to apply for citizenship now in 2017, do I have to re-apply Certificate of Good Conduct? You might be requested to do so. Do I need to apply for Australia Police check ? Hello there, I want to apply for Australian citizenship, but my passport expired around three years ago. Can I still use that passport’s information when filling the ‘Passport Detail’ section in the application form? Or should I renew my passport? Apart from passport they also ask you for some other documents. Write some explanation that you do not have a current passport. Thay may accept that. 1) I don’t have my original birth certificate. I ordered a new one from the U.K. And they have sent me a certified copy. This is all they will send me, is this sufficient? 2) I don’t know the exact dates of all the places I have travelled overseas since I was 18. I know the locations and the years but not the exact dates. My passport wasn’t stamped every time, will this be an issue? 3) in the birth certificate section it asks for your id number. It isn’t clear what number this is as it doesn’t have this heading on any of the numbers on my U.K. Birth certificate. Hi I am an Australian Citizen and have been since berth. I have moved to India for work about 3 years ago and in the meantime got married here. I would like to know if my wife would be eligible for citizenship. After a couple of years of Permanent residency – very likely yes. First of all, we’d have to apply for Partner visa for her. Please give us a call to +61 (7) 3668 0658 to discuss. I had i PR as a child. for four years. I lost it when my mom got devorsed and we moved back to Sweden. I have a sister and she is born in Brisbane. I have lots of school rekords, dokuments, passport, and i wonder now if i can get a new PR or maybe apply for Citizenchip as an audult. hi! i am arrived in Australia last month for my bachelor degree in tourism and hospitality course and i want to ask you one question . If i will change my course and college after 6 months , will it draw any effect when i apply for Australian citizenship in future. DIBP does not look so deep into details of your visa when it comes to citizenship determination. They are interested how many years have you been in Australia as a temporary and permanent resident. I was born on3 November 1962 in the Australian Territory of Papua. Both my parents are Papuans born before 1949. I believe that one or both of my parents were ”Australian Citizens” at the time of my birth. Therefore I believe further that I am eligible for Australian Citizenship. I believe that my parents were Australian Citizens at the time I was born. Please advice if this is the correct path to take or is there another path/option that may be available under my circumstances. I will be eligible for citizenship by conferral in 6-8 months and I intend to include my 7 year old son as my dependent in the citizenship application. Must my son be onshore during the citizenship application process (e.g. at time of application, at interview, at time of decision or at ceremony) ? Is your son also an Australian PR? Will the other parent also agree to a citizenship grant? Hi, yes the child is an Australian PR and the other parent agrees to citizenship grant. I can apply for citizenship by conferral in a couple of months and would like to add my child as my dependent in the application. We are both Australian PR. Hi, i was a divorcee 5 years ago with a son. Got married to an Australian citizen and entered Australia 5 years ago with a partner visa. Stayed here for 5 years together with my son from my ex. Never leave the country for more than one month each trip i made. May i ask if i gonna apply citizenship for my son, is he eligible to apply one before he is 18 years old? As I understand your Australian ex is a parent of your child? In such a situation your child might be eligible for a citizenship. Give us a call to discuss. then in September 2013, along with my husband and 2 boys, we came to live here joining my family and all the cousins, on a 457 visa. then we have applied for PR on Feb 2016 and now still living here since then. We have got our PR visa just recently in early September 2017 after lodging the PR application by 19 months, it’s all good now. My question is, with the Australian Birth Certificate and the current Permanent Residency visa, is my son eligible to apply for the Australian Citizenship ? or he will be eligible when we are eligible as a family? you’d have to have a PR visa at the time for your son to be eligible for citizenship. I emigrated with my parents from the UK in 1961 aged 5. Both parents were born in UK. I left Australia in 1984 to live in the USA. I have always maintained a Australian resident visa to date. My current RRV expires March 2018. I have spent 490 days out of Australia within the past 4 1/2 years. The time away was to visit family in the UK and USA. As I will not be eligible for a Australian passport what rules apply for this situation. Will I have to start over again when I get my new visa. first of all think about renewing your RRV as long as you are eligible for 5 years travel facility. Not sure what you mean “start over again”. They do count your time on PR visa in Australia. By start over I mean when I get my RRV renewed will I need to wait another 5 years and apply the same rules as before. ie maximum time out of the country being 12 months out of 5 years? We don’t know the new rules yet. Type of PR visa does not matter, it’s the time spent in Australia as PR. I have got PR visa and my husband as well. it seems we have met the requirements for applying AUS Citizenship but thinking to apply only for our 3 kids(16, 2 other younder child ) at the moment. Is 1290 form the right form to apply for them? And if I’m applying for them, do I have to fill my kid’s name on the “Your Details” part? I arrived in Australia on a PR in Jan 2014. My wife and daughter came later in May 2014 on the same PR visa. I’ll be eligible in Jan 2018 as per residency requirements for Australian citizenship. Will my wife and daughter have to wait until May 2018 to complete the 4 year requirement or can we all apply together for citizenship in Jan 2018 when I’ll be eligible. I am here in Australia on 31 July 2014. I have a permanent resident. I will finish 4 years on 31 July 2018, I did not go out Australia since I come on 31 July 2014. Based on the requirements of citizenship, I can apply for the citizenship on 31 July 2018. However, the government announced that it will not accept any application starting from 1 July 2018. What should I do in this case, please? I am very worried about this. Once you lodge the citizenship application; when can you book a test ? I am eligible to apply for Australian citizenship. After lodging my application online, can I leave Australia for a few months and then come back when I have been invited for the citizenship test? Should I be onshore during the citizenship application process? Does my wife need to apply separately to me for citizenship? If so, on who’s application do we put our children? hers, mine or both? I have first arrived in Australia as a student on 19June2017 and then left Australia on 10Aug2017. I have only returned back to Australia after over 4 years on 08Nov2017 with a Permanent Resident Visa Subclass 189. Will i be eligible for applying for citizenship since i have spent a total of more than 5 years in Australia and as a Permanent Resident for over 3 years? Or should i have to wait until 07Nov2018 to apply for citizenship? Sorry for the typos in the email above with the dates. Please see the correct dates now. I have first arrived in Australia as a student on 19June2008 and then left Australia on 10Aug2010. I have only returned back to Australia after over 4 years on 08Nov2014 with a Permanent Resident Visa Subclass 189. Will i be eligible for applying for citizenship since i have spent a total of more than 5 years in Australia and as a Permanent Resident for over 3 years? Or should i have to wait until 07Nov2018 to apply for citizenship? For the citizenship application, do we include children under 16 in both of the parent application, like both Mom and Dad, or just one parent? – I got PR grant in Sep 2017 and come back to Australia as permanent resident in Oct 2017. Cuz I have left Australia from March 2017 until Oct 2017 to wait for PR grant when did not have any Australia visa during that time. Im just wondering in that case Am I still eligible to apply next year or I have to start my 4 years since I got PR grant.